The tone was set two-and-a-half years ago and now even the scribes have caught the insult bug. David Haye was asked by a German reporter in Hamburg if he feared getting an injury to his tongue. Bring it on. Haye's mood across two days of exhaustive promotion has been described as subdued. It's all relative. Still he found the grace to pick apart Wladimir Klitschko's list of beaten challengers as a feast of "fat, little puddings". The Ukrainian was dismissed as a "fraud" and derided as being "solely responsible for killing the heavyweight division". Taking up residence on the moral high ground doesn't sell tickets (or pay-per-view buy-ups). Two years ago, in response to the severed heads T-shirt stunt, Klitschko vowed to leave Haye's face looking like a pizza. And the beat goes on. These are two confident, accomplished performers at the mic, and it's been hard to split them on points over two days among media scrums. For me, each of them looked more comfortable at their home gig: Klitschko on Monday in Hamburg, Haye in London 24 hours later. Behind Haye's diatribe is a point worth debating. Klitschko's figures are impressive but the names are not as striking as the numbers. In his second reign as champion, Klitschko has fended off nine challengers (eight inside the distance) across five years. Haye would have started favourite against all of them. But would he have found the consistency, the almost robotic discipline inbred in Klitschko? In two terms as champion, Klitschko has engaged in 18 world title fights, winning 16. Lennox Lewis has an identical log (albeit over three reigns), which serves as a statistical compliment to Klitschko. But while Lewis's list is hardly bulging with all-time greats, it is deeper in strength. Klitschko has been decked 11 times in his 15-year pro career and Haye was keen to stress that a fighter "cannot change his DNA". Something, though, has changed. Klitschko has not so much as touched down since becoming champion for the second time in April 2006. Just as the Government and the Opposition spin the rise and fall of unemployment and inflation figures, so the details are open to interpretation. And abuse. The circus of the past two days amounts to pretty much a summary of why Sir Henry Cooper became disillusioned with the sport which made him a hero. His ilk will claim such behaviour is an example of all that is wrong with the sport. Others believe firmly that the heavyweight division needed such an injection of bad blood. Certainly, no fight in the glamour division has commanded such attention in a decade. Even the Americans have suddenly remembered the big boys still exist (HBO are showing it live). Angelo Dundee, the legendary trainer, has often said that, in boxing, silence is a crime. 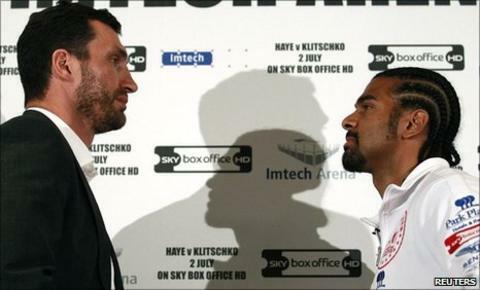 In which case, Haye and Klitschko won't be up before the beak for some time yet.